As I revealed in my last post, my first experience of Sherlock Holmes in print was not the Canon, but a pastiche, The Seven Per-Cent-Solution by Nicholas Meyer. Of course, in the 1970s this was a pretty good choice of pastiche, so I might not be as ashamed of this as I'm pretending to be. After reading the Meyer, I did begin to pick up the Doyle collections and started to give the Canon a proper read. But I craved another post-modern pastiche novel in the style of Solution. Luckily, because of the success of the Meyer book (which was also made into a film), my local Waldenbooks had quite a few of these to choose from. 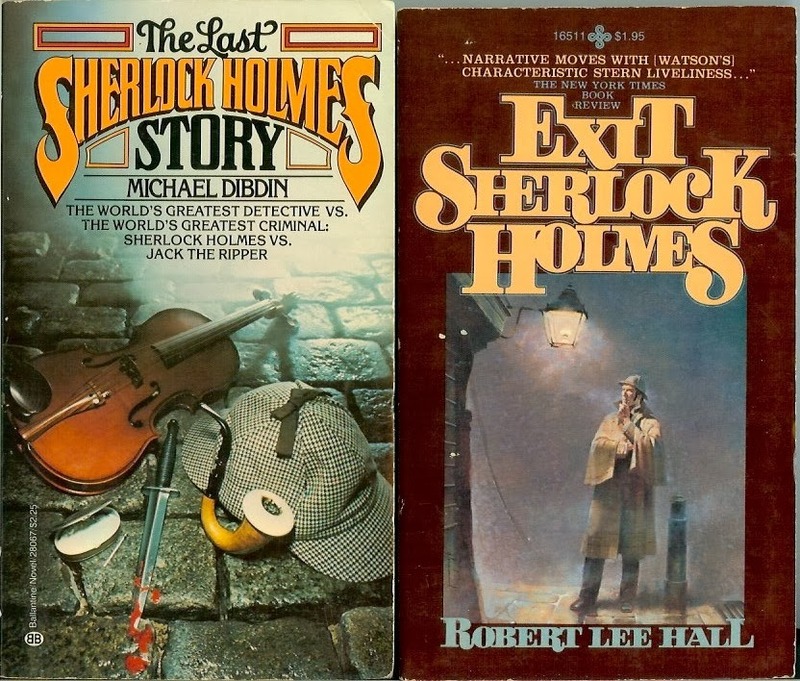 The first two I came away with were The Last Sherlock Holmes Story by Michael Dibdin and Exit Sherlock Holmes by Robert Lee Hall. What drew me to these two paperbacks was the cover art. These are exactly the kinds of covers a budding young Sherlockian would be attracted to (I still like them). Also, The Last Sherlock Holmes Story promised an encounter with Jack The Ripper, so that was pretty irresistible. While these did not live up to the level of The Seven-Per-Cent Solution, I still enjoyed them both. They are well-written adventures with their own revisionist "twists." (SPOILERS AHEAD.) In The Last Sherlock Holmes Story, the great detective turns out to actually be Jack The Ripper(!). In Exit Sherlock Holmes he's revealed to be a time traveler. While I didn't really care for the twist in Last (Holmes cannot be a murderer), the time travel element in Exit Sherlock Holmes is handled better than you would expect, and I've always though this novel would make an interesting Sherlock Holmes film.